I ended up ordering the Down For It Vest for a few reasons. My main reason is it perfectly matches my Nike running shoes, but I also like that it’s a neutral that isn’t boring black, and it’s nice and long. Vests seem really silly function wise because if it’s cold enough or rainy you are going to want a full jacket, but I actually use them a ton on my way to or from the gym because I can just throw it over whatever RULU pullover I’m wearing. I have quite a few vests already though so the only way I can justify keeping this one is if I sell one I already have (The Fluffiest Vest on the BST group on Facebook). I like it and I want to keep it but not enough that I want to stretch my budget this much. 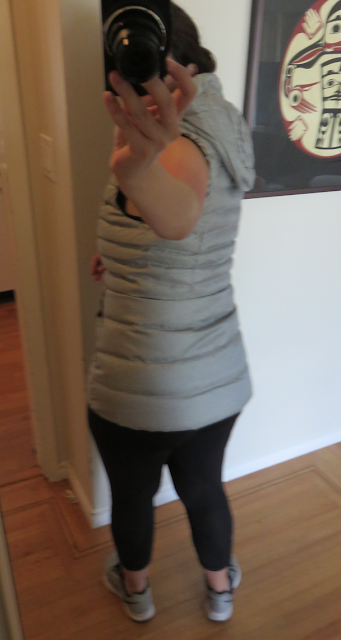 The Down For It Vest is surprisingly roomy in the hip area. I expected that because it was so long over the hips and I am pear shaped that it would be really snug there but it flows over quite nicely. I find it really slimming in profile, and because of the black contrasting on the zippers and the way it is angled, plus the busyness of the hood area, I think it could be really flattering if you are pear shaped and long in the torso. If you are slim build or hourglass shaped with a short torso I think it will be very boxy. "Midnight Bloom Wunder Under Pants, Split Short Sleeve, Love Scoop Long Sleeve, Midnight Bloom Sculpt Tank, Wunder Under Pants/Diffusion White Black, Rise And Run Bra, Run Around Tee"
"Review: Monthly Subscription Box Popsugar Must Have Box"
I got the black one. i have 3 boys and that grey color will get destroyed… 🙁 I love this vest. I like it on you a lot. Does it have a denim look? Looks great! It has a slight printed texture but it's not actually textured. I'd say it's more of a printed 'marled' grey vs. a 'heathered'. I'm such a fan of their vests, especially during weather like this. Random question, but have you heard anything about the SeaWheeze registration??? I swear it was this time last year! Super cute!!! I like it on you! If I hadn't just bought a fluffin' awesome one off ebay, I'd be so tempted. Looks awesome on you! 'Flowing over my mighty booty sounds good but I have a short torso thanks for the review! Looks great on you LLM and really pairs well with the Nikes. Yeah I didn't like it on the LLL models and it was an easy pass. After seeing it on you I really like it. I like that the hood comes off! I really like it. Looks good and functional. I live in Colorado and agree a down vest is essential. Got my order and super disappointed. I like the midnite bloom print but I don't love it. I think it photographs better than it looks in person. It's kinda dark and murky instead of vibrant. I took a photo which makes me want to keep the run backpack but I'll probably return. I will probably keep the sculpt tank in it and the crew neck love tee is nice but arms are tight. Surprised emperor blue is more of a navy. Oh I had that happen with tonic sea bra…colour was dingy compared to Web pics…I ordered speeds in midnight bloom…I guess I may be returning…that's ok with price hikes I am much pickier about what I keep. Oh no 🙁 I ordered both the backpack and the yoga mat bag in Midnight Bloom… was hoping it would be pretty and vibrant rather than dark and murky… It takes about a week for me to receive my orders, so will have to wait until this coming Wed or Thurs to see. I will be returning both if I don't absolutely love. I am also being much more picky and selective with my lulu purchases. I was hoping Emperor Blue would be a more unique and prettier medium shade of blue/purple than more of a navy shade. Will be an easy pass on the Emperor Blue Define then if it ever comes to Canada. Anon 5:21, Same thing happen to me with the Tonic Sea Ta Ta Tamer bra… I didn't love the colour in person either. Would have loved it if it was more cheerful and vibrant like Menthol or Bali Breeze… instead it's a more dull and gloomy light green. Let me know what you think! I'm curious if anyone else feels similar. Thanks lulumum! Being on the short side at 5'2" with a bit shorter torso and hourglass shape this vest would probably look hideous on me. I look my best in tops/jackets/vests that define my waist. I'm petite but have bigger bust and bum for my size so I end up looking dumpy or pregnant with loose/baggy around the middle or boxy cut tops, or as wide as I am in height, haha, definitely not a good look for me! 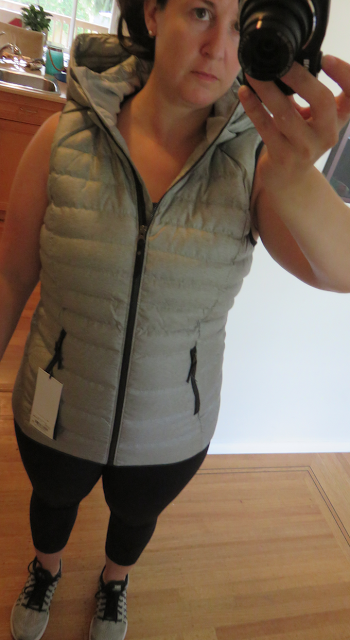 After seeing how great this vest looks on you I went to my store hoping to try it on, but they didn't have them yet. So had to order online. I bought Rush hour LS in gray and WU in Diffision. Rush hour fabric felt very soft. I grabbed my size hopefully it'll fit ok. I saw one of eds wearing the sapphire one ( very pretty color) and it looked great on her. I also saw Heringbone and Teeny tooth chilled grape ( I think) Defines, but didn't have time to check them out. 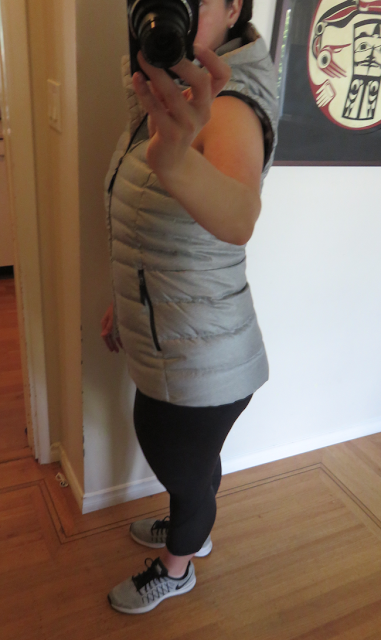 Did you get the same size in the down for it vest as the fluffed up vest Lulumum?